Road Warrior. Das Dell Latitude D430 gibt sich im Test als mustergültiger Weggefährte. Leise, kompakt, leicht und gut verarbeitet kommt der derzeit kleinste Spross der Latitude-Serie daher. Aus dem kleinen 42 Wattstunden leistenden Akku presst es dank besonders sparsamer Komponenten bis zu sechs Stunden Laufzeit. Der genügsame Core 2 Duo Prozessors mit 1.2 GHz Taktfrequenz lässt in Verbindung mit der ultraschnellen SSD-Festplatte im Geschäftsalltag dennoch nie Leistung vermissen. Das Dell Latitude D430 präsentiert sich als hervorragender Begleiter für Vielreisende. Es ist angenehm leicht, tritt stilvoll-elegant auf und kann auf hochwertige Materialien zurückgreifen, die auch haptisch durchweg einen sehr angenehmen Eindruck hinterlassen. Akkulaufzeiten von bis zu sechs Stunden garantieren auch auf längeren Trips unterbrechungsfreies Arbeiten. Das leuchtstarke Display erlaubt dabei auch problemlose Einsätze unter freiem Himmel. Per UMTS lässt sich optional nahezu permanent von fast überall aus die Verbindung zum Unternehmensnetzwerk halten. Hinsichtlich der Ausstattung erfüllt das Notebook alle Businessansprüche. Dank des Fingerabdrucklesers und des TPM-Sicherheitschips sind die Daten auf der Festplatte vor fremdem Zugriff zuverlässig geschützt, die optionale Dockingstation garantiert in Kombination mit dem externen optischen Laufwerk komfortables Arbeiten im Büro und am heimischen Schreibtisch. Leistungstechnisch muss das kleine Subnotebook hinter den meisten anderen Laptops natürlich zurückstecken. Stromsparendes Sub-Notebook, das durch die Bank solide Testergebnisse brachte. The Dell D430 has made some significant improvements with the dual-core refresh of the notebook. Driver quality, one of my biggest complaints that could ever be improved upon, has noticeably improved! While the dual-core version does sometimes get a little hotter, there is a noticeable improvement in battery life and speed that I am glad to see in this model. The D430 does have a few drawbacks though, so the D430 is not for everyone. Power users that need faster processors will not want this notebook...nor will anyone who despises the add-on DVD drive. In the end though, the D430 is suitable for any and all office tasks and many people would be perfectly happy with the computing power available in ultraportable notebooks today. Notebooks in this category are largely evaluated on portability, longevity, and build quality. The Dell Latitude D430 definitely managed to excel in all three categories. The laptop has the highest quality build I've ever owned, and the battery life has improved since my last review too. Overall, I would have to say that the Dell D430 has plenty of positive aspects to the notebook, but there are also a few flaws evident as well. Most laptops are not going to be perfect, and it is simply a matter of user preferences that determine what features of the notebook you love, and what flaws you cannot live with at all. As an ultraportable machine though, the Dell D430 strikes a great balance between features, portability, and price. The amount of power inside of the laptop, even though it is a meager amount, is more than enough power to run 95% of your daily/average computing tasks. And for those who need more power, there are dual-core options available. Sure, the laptop admittedly has flaws like the horrid speaker and the slightly-below-average screen, but the D430 has too many good things going for it to turn it away as a potential system. But notebooks in this category are largely evaluated on portability, longevity, and build quality. The Dell Latitude D430 definitely managed to excel in all three categories. This laptop is the best built I think I've ever owned, the battery life is respectable given the notebook's size, and the notebook's size itself is a huge boon to portability. 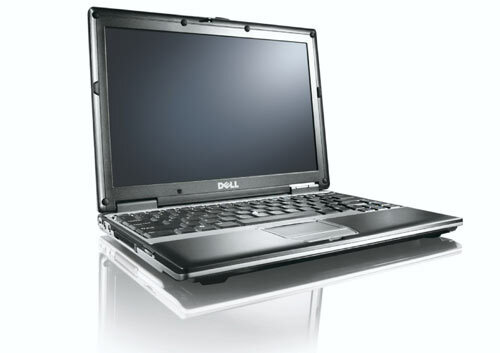 Dell's Latitude D430 is the successor to the company's excellent Latitude D420, which has been sitting proudly atop the A List since issue 144 (92149). There isn't much change to see on the outside, as the D430 looks exactly like its predecessor; in many ways, that's a good thing since this remains a high-quality chassis, but it does result in a few compromises. Chief among these is the lack of an optical drive. Considering the D430 weighs 1.5kg, and Sony manages to pack an optical drive into the 1.13kg VAIO VGN-G11XN (web ID: 107284), this is disappointing. Instead, there's a MediaBase (included in the price here; use E-Value code: MAG-430PCP) that clips to the bottom of the notebook and gives you a DVD-RW drive, DVI and VGA outputs, and acts as a port replicator. You can carry the notebook around with the MediaBase attached, but it increases the weight to 2.1kg. 84.25%: Diese Bewertung muss man eigentlich als durchschnittlich ansehen, denn es gibt etwa ebenso viele Notebooks mit besseren Beurteilungen wie Schlechteren. Die Verbalbeurteilungen klingen aber oft besser als sie wirklich sind, denn richtig gelästert wird über Notebooks eher selten. Obwohl dieser Bereich offiziell meist einem "Befriedigend" entspricht, passt oft eher "mäßiger Durchschnitt".